At Hollard we call our business purpose “Better Futures”, and with good reason: Everything we do, and the way we do it, is aimed at enabling more people to create and secure a better future. And there’s no better example of Better Futures than Hollard Highway Heroes, our annual competition to identify South Africa’s best truck driver. The overall 2019 Highway Hero will win an awesome R100 000 in cash and prizes (along with substantial prizes for the other finalists, too). Previous Highway Heroes winners have been able to do things such as invest, pay for their children’s education and renovate their homes with their winnings. That’s Better Futures in action. But Highway Heroes takes Better Futures much further than that, because it’s not only truck drivers who benefit from their participation in Highway Heroes. We all do. Participation in Highway Heroes requires drivers to internalise good driving habits. We’ve found that not only do participants improve their driving, they continue to drive that way long after the competition has ended. This results in lower fuel and maintenance costs, as well as fewer accidents and insurance claims. We’ve discovered, to our delight, that they’re inspired by colleagues who have entered Highway Heroes, and they emulate them. Of course, because our customers are able to reduce their risk and we consequently have fewer insurance claims to process. And you and I benefit. 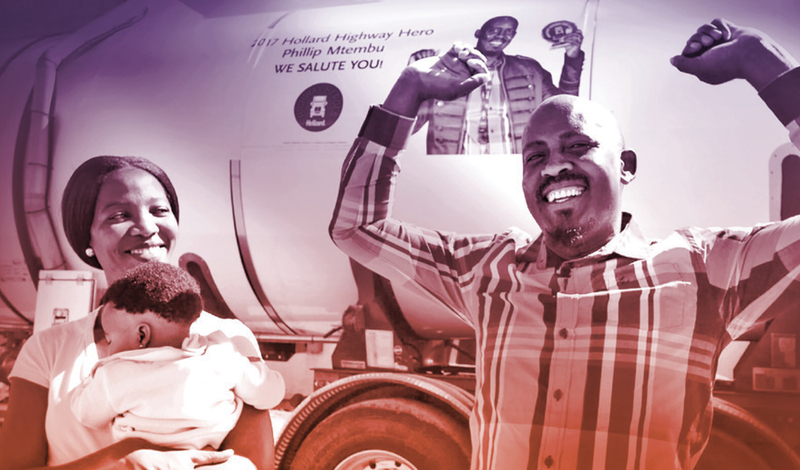 Hollard Highway Heroes has one more important function: to highlight truck drivers and the tough jobs they do, and how central they are to our economy. Virtually every commodity we consume is transported by road at some stage, and none of it would reach us without … truck drivers. So while only one driver out of the thousands who enter the competition can be named the Highway Hero for that year, we believe that all truck drivers are Highway Heroes. They work long hours, often spending weeks away from home and loved ones, and face all kinds of dangers along the way – from treacherous road and weather conditions to criminal activity. We acknowledge truck drivers for everything they do for us, and we salute them! 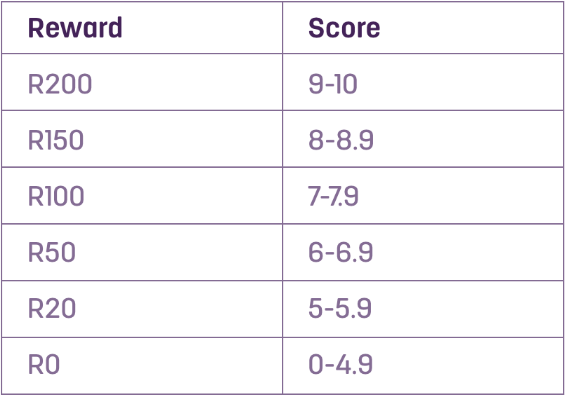 The Hollard Risk Services Loyalty Program rewards drivers for ongoing good driver behaviour and is offered to you as an benefit as part of your cover. It is based on a pre-defined set of driving and safety parameters. All rewards obtained by your driver, employed by you, will be loaded on a customised cash master card which will be sent to you for each driver. Drivers will have the option to swipe their loyalty card at any master card partner across South Africa. Your vehicles must be monitored by the Hollard Risk Bureau. Your vehicles must be fitted with a qualifying tracking device (Mix, Tracker, Netstar, Ctrack, Lynx, Amber and Icab). All drivers employed by you must be tagged (standard fitted driver identification device from a qualifying supplier). All drivers employed by you must be permanently employed. Your Fleet must be insured by Hollard Commercial Vehicles. Your Premiums must be paid fully and/or must be up to date. Hollard’s decision in respect of any reward is final. Hollard will not be held liable for any 3rd party system down time or system breaches and/or any points that are lost as a result hereof. Rewards will be paid on the 15th and 30th of each month with a capped amount of R400.00 per calendar month per driver. You will be liable for any card replacement fees. Hollard will not be held liable for any damages or losses which may occur as a result of theft or lost cards and /or negligence by either the driver or the Company. All rewards will be forfeited at the discretion of Hollard in the case of any fraudulent scheme, trick or device or false pretense practiced by the driver or the Company or any person having custody or possession of the vehicle. All rewards awarded in respect of this loyalty program will be forfeited from the date of any fraudulent conduct. No insurance will be offered on the monetary reward paid and nor will such awards be applied to any insurance premiums payable. The rewards will not be transferrable. Should the insured have outstanding amounts payable to Hollard as at the premium due date, the program will be cancelled with immediate effect. Hollard will not be held liable for any costs including but not limited to, the replacement and maintenance of any driver ID tags. Should the tracking device be faulty or the warranty lapses or the vehicle is in for repairs, or the devices are not repaired to the manufacturers approved standard, no rewards will be granted until such time that the tracking device meets the standards as determined by Hollard and is in working order. Hollard reserves the right to discontinue this program by providing you with 90 days written notice. Hollard will not be liable for any tax consequences or any other levies which may arise. Hollard reserves the right to amend the loyalty program and terms and conditions of the loyalty program by providing 30 days written notice. What qualifies as state of the art tracking? What if I have foreign drivers? Foreign drivers are welcome to enter as long as they are 18 (eighteen) years or older and have a valid identity document or passport. Driver Participants must be permanently employed by the Fleet Owner and have a valid driver’s licence. What if I cannot supply the data required within 48 hours of requesting such data? We have very strict parameters and unfortunately the driver/s will be disqualified in this instance. What if my driver is cross border during the top 50 installation window? What if my unit stops working during the monitoring phase? We have very strict parameters and unfortunately the driver/s will be disqualified in this instance. Unless the supplier can retrieve the data required. How will the prize money be paid? All prize moneys will be paid via EFT into the winning driver’s bank account 48 hours after the awards ceremony prior to the banking details being confirmed. What do I as the fleet owner get out of this? You will get the highly sought after Hollard Highway Heroes title in the trucking community. This will also be the first ever public title available. What security measures are in place to protect my sensitive tracking data? We have very strict privacy policies in place that are in accordance to the POPI act of South Africa. I have refrigerated trucks or move abnormal loads, under what category should I enter? The routes my trucks travel do not allow me to stop every 2.15 hours at night, how will this affect my score? Most of contestants have the same concern and will therefore also be scored on the same parameters. We advise all drivers to only stop at safe areas. It is important to take frequent rests in order to avoid fatigue driving (ignition off is measured as resting periods). My trucks overtake and then go over the speed limit, how will this affect me? Whilst we do understand this, a speeding count will generate in this instance. We implore drivers to stick to the legal road speed at all times. Will my score improve if I travel less kilometers. Hollard Insure is a division of The Hollard Insurance Company (Reg. No. 1952/003004/06), an authorised Financial Services Provider.